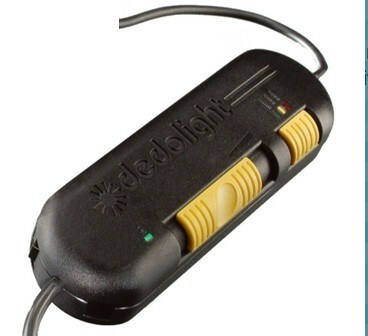 Dedolight DT24-1E – single combined 24V transformer dimmer allows Dedolight DLH4 heads to be powered via 230/240V mains AC supply as well as dimmed in one practical unit with 24V lamps up to 150W. Features a slider dimmer and 3 position switch offering preset 3200K, 3400K and variable dimming. Note – extension cables should not be fitted between the DT24-1E and the DLH4 head as voltage drop will cause failure of DT24-1E – it is designed to be used with the DLH4 connected directly to it (hence its portability. Mains extension cable to the DT24-1E should be used if no mains supply is close enough.